A luxurious coastal cottage located conveniently in the East Beach district of Gulf Shores with a short walk to a private beach access. Features include heated & cooled entry and storage on ground level, quartz countertops throughout, a shiplap wall, 10' ceilings & crown molding in living room with solid plank flooring throughout, tiled shower w/ glass doors in master bath and custom tile surround tub/shower combo in guest baths, custom cabinetry, glass back-splash, stainless appliances w/ side by side refrigerator & full sized washer & dryer. Custom pool and brick paved streets. 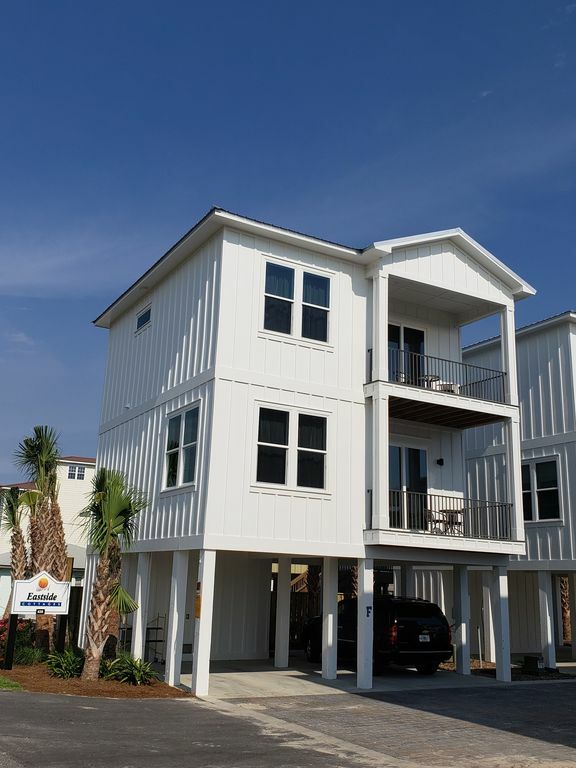 district of Gulf Shores with deeded beach access. " FREE WIFI"
distance to The Hang-Out, many restaurants and numerous family activities. This is Gulf Shores newest beachside community, lovely and quite neighborhood all within blocks of entertainment and the newly renovated Gulf Shores public beach area! this complex does have deeded beach access the Seawind Condominium and Seawind office building. There were a few "gliches" with the key pad and the property management company were very helpful and prompt. Overall, it was a great week visiting with grown granddaughters. Thank you Joanne for letting us be a part in your family vacation with your granddaughters! We look forward to seeing you again next year! We had a great time!!! The Cottage was everything we thought it would be and more. Had plenty of room. There was four of us. The kids had a great vacation. Short walk to the beach which was great. Cottage is on a quite street within walking distance to a lot of stuff!!!! Will definetly rent again next year!! Cottage is very well maintained and clean. thank you John for the kind words and review! We look forward to seeing again February 2020!! After staying here, I can honestly say I could not be happier. First off, the location is as good as it gets. You really don't need a car even though there is covered parking for two vehicles, which is a plus. Close proximity to the beach, shops, restaurants, ice cream, etc. Calling this property close to such things is an understatement! We rented mopeds just a few blocks away. The home is equipped with flat screens in the living area and each bedroom and a flat screen TV with each bunk! A full bathroom is located off of the main living area which is an added bonus if needed. The third floor has a master bedroom with a master bath with access to the balcony with a gorgeous view of the pool. The second bedroom has its own bathroom and balcony access also. The home is smartly decorated and the cleanliness was excellent. Wonderful spacious kitchen, stainless appliances, beautiful furnishings, an open feeling (no cluster), an adorable pool, the list goes on and on! Also, I must mention Aqua Vacations and Sales Group was a pleasure to deal with. I would highly recommend Eastside Cottage F. You won't be disappointed! Thank you Mrs. Key for the great review!! The house was nice and clean. The pool was clean and heated. We had to change plans last minute due to Hurricane Michael and this rental did not disappoint. The walk to the beach was longer than we'd like, but the beach is so clean. Gulf Shores was a huge hit with our family and we loved the house. Thank you Danielle for the great review! We hope you and your family will make Gulf Shores your next beach vacation!! Awesome coastal retreat! It's new and clean and beautifully decorated. Just a short walk to the beach and restaurants and shops. We had such a good time, we stayed and extra unplanned night! A definite repeat! thank you Louella for the great review and comments!! We look forward to seeing you again next year! we enjoyed our stay at the cottage very much. I will recommend the property to all my friends,. Thank you Lorrens Family for the great comments and review!! We look forward to seeing you and your family again next year!